Hey There! How’s it goin? Before we get into the body weight workout I want to share with you today, let’s talk about a holiday health & fitness challenge I’m doing for the next few weeks! 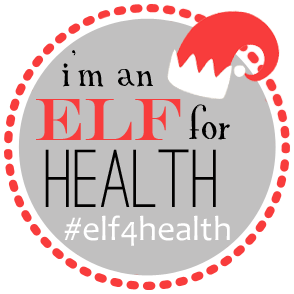 This Christmas I’m taking part in the Elf4Health challenge hosted by Lindsay at The Lean Green Bean and Elle at Nutritionella. It’s basically a list of daily challenges – like going without meat, doing 100 burpees or even something as simple as calling a friend – that you have to accomplish. You are paired up with one other person – your elf – and you have to motivate each other to complete the challenges. Unfortunately, I missed the first day because the challenge was the last thing on my mind after my mystery illness and fall this weekend :(. Today’s challenge is to try out a new workout. I’ve chosen to do a yoga class at my gym but I thought I’d continue the At-Home Workout mini series I seem to have started, with a body weight workout. I generally break up my workouts into segments like back and biceps or chest and triceps so I can really focus on one or two things. But sometimes I switch it up with some full body exercises just to shock my muscles once in a while ;). One thing I love about this workout is that it’s easy to modify depending on your experience with exercise. Beginners can do it as is or with slight modifications in the pushups and planks, while more experienced people can up the number of reps or sets and do different variations of exercises like the plank! What are some of your favourite body weight workouts? Share in the comments below!